The Briton won 6-7 (3-7) 6-2 6-2 7-6 (7-3) and goes on to face Argentina's Juan Martin del Potro. It was Murray's 18th win of a season that has been interrupted by illness and injury. British number two Kyle Edmund also progressed after beating Renzo Olivo 7-5 6-3 6-1. The 22-year-old Yorkshireman will next play South Africa's Kevin Anderson, who beat Australian Nick Kyrgios 5-7 6-4 6-1 6-2. Del Potro, seeded 29th after his own injury struggles, went through when his opponent Nicolas Almagro retired at one set all. Asked about facing former US Open champion Del Potro as early as the third round, Murray said: "It's a tough match. In my opinion he's one of the best players in the world." Murray needed three hours and 34 minutes to see off Klizan, the world number 50, and claim his second four-set win of the week. The Scot, 30, could again be heard to complain he was struggling with his movement, but once again his form improved as the match wore on. "I'm playing way better than I was two weeks ago, and today's match will have done me a lot of good," said Murray. "Physically I pulled up well and felt good, so I will gain a lot of confidence from that. And also, I hit a lot of balls out there today, more than the first-round match." It could have been a much quicker afternoon on the Suzanne Lenglen Court had Murray completed a comeback from a break down in the first set. Having weathered the expected early storm from his big-hitting opponent, Murray drew level at 5-5 only to play a poor tie-break and fall a set behind. Klizan, 27, began the match with his left calf heavily strapped and it was no surprise that his level dropped in the second set. Murray raced through seven straight games and when he made it 11 out of 13 to take a two-sets-to-one lead, there looked no way back for the Slovakian. He was offered a lifeline early in the fourth thanks to a wayward Murray forehand and made it through to 5-3, only to fail once again when trying to serve out the set. Klizan was broken for the sixth time when he framed a smash over the baseline and, despite brilliantly saving one match point, saw his challenge end in another tie-break. Murray lunged to his right to send a superb volley past the Slovakian on the second match point. "Consistency is definitely what I'm looking for," Murray told BBC Sport. "I felt a little bit more in control of the first-round match than I did today. At times today I played some very solid stuff. "The most positive things for me are physically I felt good after a pretty long match in tough conditions, and also I made some quite significant changes during the match to my tactics." Edmund's progress was considerably easier as he beat Argentina's Olivo, ranked 91st in the world, in straight sets. 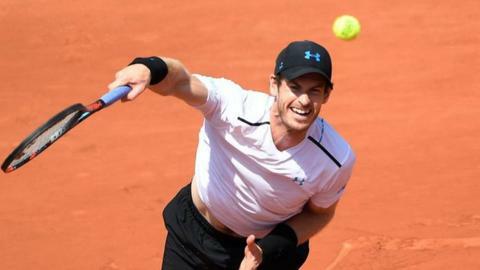 It is the first time the 22-year-old has progressed to the third round of the French Open after being knocked out in round two in 2015 and 2016. The world number 49 dropped just nine games, hitting 30 winners along the way, 18 on his impressive forehand side. "There was a stage when I really felt the match turn in my favour and helped me get on top," said Edmund. "Olivo had beaten Jo-Wilfried Tsonga in the last round and I knew I had to play well today. I am pleased I got it done." Murray expended more energy than is ideal in a first-week Grand Slam match, but time on the match court is important right now - and every win valuable. He is starting to play very well for periods of a match and now seeks to add the consistency required. Edmund knows he has a formidable game when he is on song and is learning to trust his instincts in the Grand Slams. He beat Richard Gasquet and John Isner in his run to the fourth round of the US Open last year and will emulate that with a victory over the slightly lower-ranked Kevin Anderson on Saturday.